Join us for an evening of information vital to our CV Library customers. We will have fact sheets on the Tulsa County Bond Election scheduled for December 14, 2004. Library personnel will be here to answer your questions about the Bond Package. How is the Library currently funded? Why is extra funding needed now? How do citizens give input into the program? What will you see happening at the Collinsville Library? It is a come and go affair. See you at Your Library! The Friends of the Collinsville Library will be hosting their fifth annual Silent Auction at the Collinsville Library. Once again we are in need of sponsors to donate decorated Christmas trees (no taller than 4 ft. please), wreaths, centerpieces and gift baskets. You may decorate items in any theme you wish. Maybe you would like to decorate using products that describe your business or organization. Creativity abounds when we let loose our imaginations. Donated items may be taken to the library (1223 W. Main, Collinsville, OK) beginning Monday, November 15th through Monday, November 29th. Each donation will be attractively exhibited upstairs in the Collinsville Library and will have a card displaying the donor's name and/or business. This auction will be open to the public. Bidding will begin at noon on November 30th and will close at 5 PM on December 11th. Please call 596-2840 for more information. 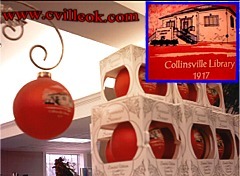 Historic Collinsville Library Ornaments are on sale by the Friends of the Collinsville Library for $5 .